Caring for client websites requires a passion for customer service and expert technical knowledge that not only keeps your client websites safe and healthy, but also keeps your brand reliable, dependable, and reputable. 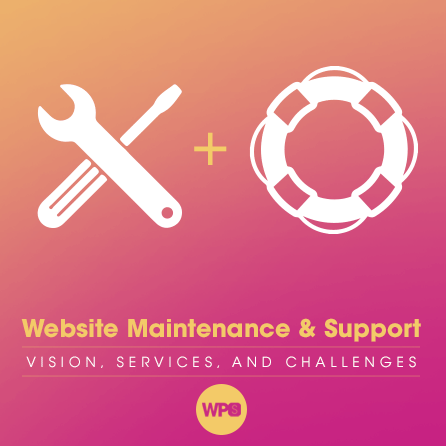 In this presentation, we’ll cover a variety of considerations you should have when providing WordPress maintenance and support, the challenges you might face, and your available options. WordPress maintenance and support—sounds easy, right? It could be if you only have a small handful of clients with minimal requirements. But what if you want to grow your business to have 20, 50 or even more clients, each with a variety of service needs and some quite possibly with regulatory or service level agreement demands? Still thinking about starting your own WordPress maintenance and support business? Well then, you’ve come to the right place! This session will give you first-hand insight into some of the strategies used for creating your identity within this competitive marketplace, and how you can set a foundation for outstanding customer service and stand out from the rest of the competition. Because the road to success won’t be an easy journey, we’ll also go over the many challenges you will face when building a larger client base, increasing services and adding additional staff as a result. In the end, if you feel that starting your own WordPress maintenance and support business is not right for you, we’ll discuss how relying on a trusted WordPress maintenance and support provider like Maintainn might be a better option for long-term success. Brad is the CEO and Co-Founder of WebDevStudios (WDS). He is also a US Marine Corps veteran and served one tour in Kuwait/Iraq for Operation Iraqi Freedom where he learned to program while wearing a gas mask. Brad lives in Philadelphia with his wife and son. He’s obsessed with cheesesteaks, Raider’s football (it’s complicated), podcasting, Halloween, LED lights, and all things technology.